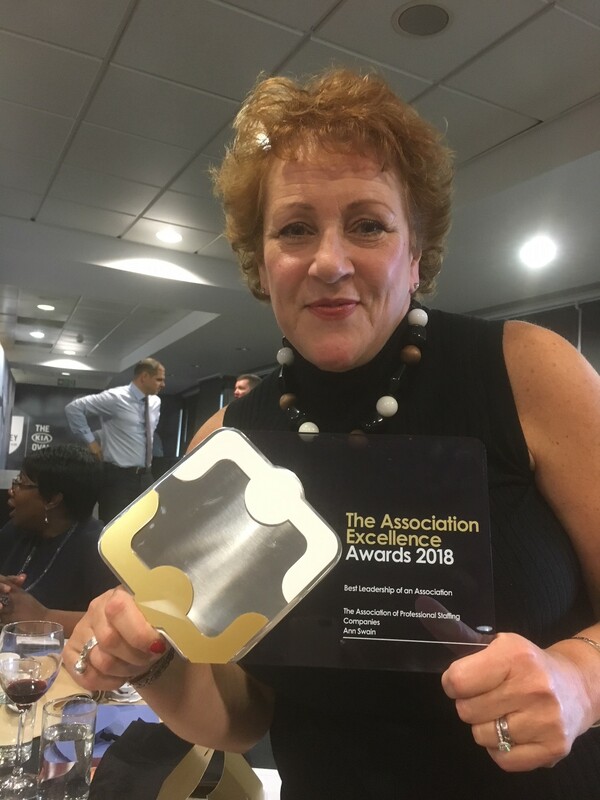 Ann Swain, Chief Executive of the Association of Professional Staffing Companies (APSCo), has been honoured at the 2018 Association Excellence Awards, picking up the gong for 'Best Leadership of an Association' at this year’s ceremony. Founded in 2014, the awards recognise the hard-won achievements of UK trade bodies, professional membership organisations and associations. Bringing together an outstanding panel of judges, representing associations from every sector, they recognise individuals, teams and initiatives and highlight excellence in how trade bodies operate and serve their members. The win is the latest in a string of accolades that Ann has received in recent months: she took home the ‘Group Leadership’ trophy at this year’s Trade Association Forum Awards and has recently been ranked by SIA in both its ‘Europe 100’ and ‘Global Power 50’ lists of the most influential individuals in recruitment.